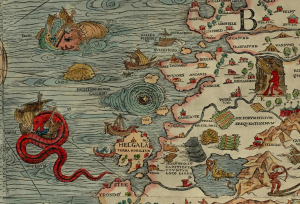 Maybe you remember those old maps with the ship at the edge near the sign that says: Warning – Here Be Dragons~! Well…Warning — Here Be Maths~! …and, yes, we promised to keep math to a minimum. But there will be drawings too, with arrows and bright colors. So, be brave. Like many of these lessons, this information is useless until there is a problem. Then the boring background information becomes very important. Some of your audience may notice and complain …or maybe they don’t complain. They just feel uncomfortable for some reason – they never come back. But you’re a pro, so let’s go. The background of the issue is that some directors and producers feel that their movie needs to be wide and expansive – big desert scenes and lots of characters spread out wide…or single lonely characters shown against the hugeness of their environment. But the director might feel that their movie should be close and snug – a focus on a character in a character-driven story. In the auditorium, the subject of screen size is different than the subject of the size of the movie. The actual size of the screen is a choice between the cinema owner and the architect. They have to decide how wide the auditoriums are going to be. They know that the movies are going to be in Flat or Scope, but they need to compromise. They either decide to install a wide screen that is perfect size for Scope, or a tall screen that is a perfect size for Flat. Here are some examples with pictures that show this. Example 1: Imagine that they have a big tall space for a screen. A big Flat sized screen fills up the front wall. Cool; a Scope picture will fit into that very nicely. Since they are the same width, we call this a Constant Width Screen. In this example have light blue and purple colors to show the 2 different screens, but of course, they are both really white. So, if a Scope movie is playing on this screen, there are 2 white bars on top and bottom, or, there will be masking that comes down from above the screen to cover a wider bar from the top. Example 2: The next example is the opposite. They don’t have the space for a tall screen. But they have the front wall space for a wide screen. For comparison, these two example pictures are the same height. The Scope size doesn’t suffer, but the Flat size does. Sometimes this is called Constant Height, and you can see why. The Flat movie has to shrink down to fit onto the Scope screen so they are the same height. 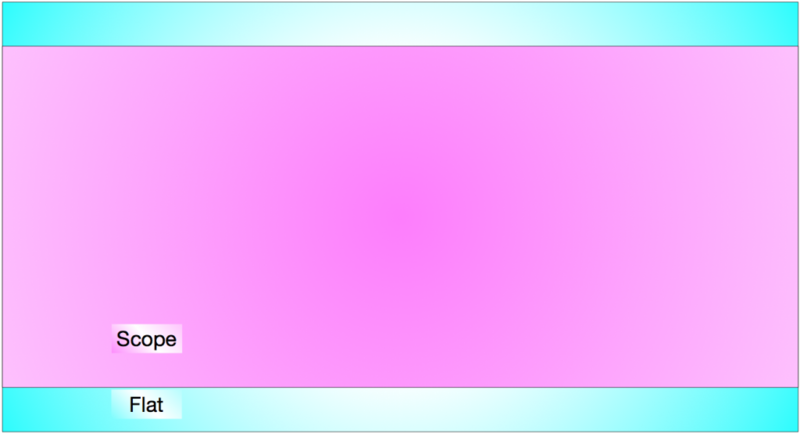 In this case, if a Flat movie is playing on this screen, there are 2 choices: two white bars on either side of the screen, or black masking can be moved in during the Flat movie. Example 3: The next example is actually more common. In a smaller room, usually the front wall is also more narrow. If there isn’t enough space for a big tall screen, there isn’t space for a wide screen. In this example, the Flat screen hight is the same as the Scope screen in Example 1. So, again, we have Constant Width. The Flat screen gets the same width as the Scope screen. The question they have is: Do we begin with a Flat dimensions, which show the Flat movies perfectly but present Scope movies smaller – and with bars on the top and bottom? 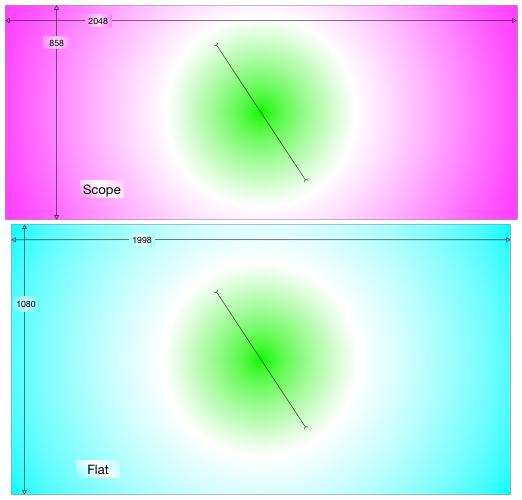 Or, do we start with the Scope dimensions, which show the Scope movies perfectly but show the Flat movies too small top to bottom, and with bars (or masking) on the sides? Let’s imagine a perfect world where there are two different sized screens in two different sized auditoriums. First is the Scope screen which is 2048 units wide by 858 units tall. You see the Star Wars movies and many big action movies in this format…but not all. Sometimes the director wants something different. For example, the most recent Spiderman movie ( Below that is the Flat screen which is almost the same width – 1998 units – but it is 222 units taller. 222 units is about 25% taller than the Scope size of 858 units. In numbers it may not seems like a lot. But imagine that your arm was 25% longer. Yeah…Avatar long hands and arms. Here it is in pictures. In a perfect world, the Flat image below is almost as wide as the Scope image above. But what is this dimension made of? Inches? Meters? Centimeters? It is very unlikely that you will measure 2048 inches or centimeters or feet or meters across. Yet, 2048 is a basic size of digital cinema. To learn this simple trick, we have to get very close to the screen when it is play a test pattern. You will see the screen and tiny holes where the sound comes through. Then magically, it will become obvious – especially if you look at a grey or white patch – that there is a set of blue and red and green dots almost on top of each. A very small distance from that set is another set of the same and another and another. These groups are the basic elements of the picture. Instead of saying “picture elements” all the time, we mix the words together and say ‘pixels’. The Scope picture is 2048 pixels wide and the Flat is 1998 pixels wide. For comparison, the same is true if you look at a TV screen or computer monitor. Computer monitors don’t have a standard width. But the HDTV standard width is 1920 pixels. Recently though, the stores are selling 4K TVs. Even if they aren’t always 2 times wider, they do have 2 times the number of pixels…3,840. 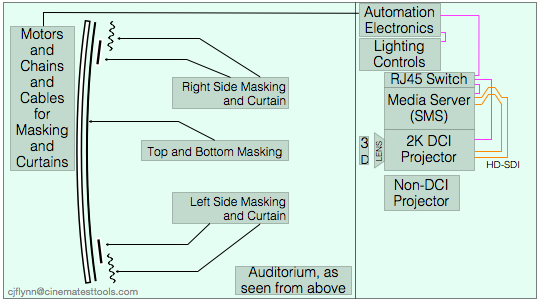 In the movie theater, the 4K projectors have 4,096 picture elements across. We’ll continue this in Part 2 of What Does It Mean: Scope and Flat?